Second day of SXSW was pretty packed. It wasn’t actually until today, with most attendees present and a full day of talks that it dawned on me just how big this thing is – at any given moment there are 30-40 odd talks going on, and it’s just impossible to go to everything that sounds interesting, especially as the events are spread out over ten different venues all over Austin. The shuttles don’t help much either, as the traffic makes it a quicker option to go on foot. That said, it is possible to catch interesting sessions. The only issue then being that if you, like I found myself at a couple of occations today, are at a not-so-interesting panel, the option of going to another is not really a viable one, as you probably won’t get there before it’s over. Today also made me take note of Robert Prattens excellent advice – at a place like this, take the opportunity to go to talks that are a bit off from what you regularly do, as the ones that are about what you do can be a bit to basic. The first session I attended was entitled ”The Last Broadcast: Entertainment is Social – What’s Next?” and featured Brian Johnson, Marcelino Ford-Livene (as moderator), Dr Jeffrey Cole, John Marcom and Gary Wheelhouse. I should perhaps have read the description a bit more thoroughly, it being about how our nowadays connected devices are changing into personalized entertainment platforms. And that was basically what the talk was about. Brian came in with some good points, for instance that the change in television as a media – it becoming more social, more connected, more online - is coming not because it is a marketing trend and not because the industry has decided so, it is happening because people want it to happen. Just at with most other things in society. Other than that, the panel was pretty dire fare, never venturing far from the field of ”wow, people want to tweet about a show” kind of thing. Summing it up pretty nicely was a question from the audience, a man trying to build a social media strategy for his broadcaster, and asking the panel to help him with some advice as many producers were of the opinion that opening up to the public is a disaster waiting to happen – what should he do? Answer from the panel? ”Yes, it’s a disaster waiting to happen. I would not be opening up.”. In my opinion, in a connected world where authenticity, openness and a feeling of ”real” is the currency you trade in (other than the quality of your content, naturally), such an approach is not only outdated, it’s outright counterproductive. To be fair, Brian was of another opinion - "do open up, explain the context and social norms will prevail". The AVAdventure showcase panel was a step in a totally other direction. 1693 Productions have launched AVAdventure, which is a tailorable solution to engage different-sized groups of people into what could be likned to an ARG or a flash mob. Is can be an interactive live play, played out over a day, or something shorter. It can be about education, promotion, music, basically whatever. People download an audiofile to their iPods and then, at a given moment, simultaneously press play and follow the instructions that they are given. Accompanied by actors and a script, they can play out almost everything, from the Declaration of Codependence to a music video. It was an interesting talk, to be sure. In stark contrast to the previous session, these people were extremely used to losing most control over things that happened - for instance, if one of 100 participants had started their iPods 30 seconds early, that person was sure to be doing stuff that got everyone else going "what? ", but in a good way. It still turned out very well and people had a great time. They’re only now thinking about sponsors etc. I think their way of doing things would have strong ties to transmedia, should one start to explore them. At the keynote of the day (with a ridiculously long line to get in, almost the whole length of the Austin Convention Centre) Seth Priebatch of SCVNGR fame talked some interesting things about gaming. If the 2000s was the decade of social – connections, if you will – then the 2010s will be the decade of games, or influence, in that case. In the 2000s, Facebook built the layer of social on top of the world, now it’s time to build the layer of gaming. As an example – the problem with schools is that the engagement is broken. The solution? Introduce status and levels. If school is a game, then grades is a games mechanic. But it’s a flawed one, as it allows some people lose. Instead, look at D&D and introduce experience points and level up. It works to change the rules; at Princeton, no one is supervising the tests. The Code of Honor that students sign also say that complicity is as much crime as the original offence. The result is that fewer and fewer people cheat. You can also use the power of leveling up in this context. As Seth said, Location Based Services are not commonplace yet. But to get them more commonplace, go more loosely location based, not tightly; it can be enough that people say they are going to be somewhere, not that they actually are somewhere, for instance. A game that people played out in the audience also showed the powers of decentralized leadership paired with a a joint goal and and a countdown. The Game Layer think is interesting, and I believe future projects must take this into consideration. Finally, on the panel on transmedia, Daniel Lorenzetti, R. Eric Lieb, Louie Provost and Christian Raymond were talking transmedia. The players on stage were pretty experienced producers and what-not. That said, I don’t think the talk really lived up to the subject of the talk. The panel mostly talked about transmedia from a movie/film/Hollywood perspective. 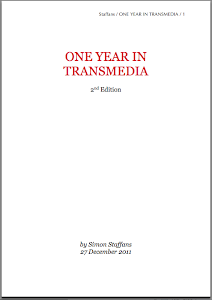 Not much talk of other forms of transmedia, not much advice in the way of how to create transmedia other than hooking it to some other content. All in all, a not too impressive panel. But some gems were to be found, like the fact that transmedia elements can prop up the project where the film Is not-so-good, but the accompanying game might be the best ever. That will keep people attached to your brand. All in all, you have the same customers. All in all, a hectic day and a day that showed the wisdom of leaving a panel if you’re not impressed and go find something else. After the day we attended meetups and parties, which was nice. Now, however, totally knackered. Will now sleep, to be fresh and back tomorrow!